To create a functional and well-engineered frame from a good idea, you have to not only test a lot but also with forethought. Tests with different riders and rider types are suited mainly to optimize geometry and chassis. Durability tests do not make sense with test riders – who wants to wait 2,3 or even 5 Years for results? That is why we test with machines, to achieve reliable results in as short a time as possible. As well as in rider-based testing, mistakes can occur in lab tests. Therefore it is important to be diligent and self-critical. Also, it is of crucial importance, not to blame possible bad test results on too hard or too unrealistic tests. If one is a responsible designer, you admit to bad results and try to use the gained knowledge to improve the product. A test only carries value if it ca be repeated as many times as needed (and that it will be repeated!) to achieve results about improvements or impairment as a result of product changes. In actual riding tests we know the weight of the rider and maybe the riding style – everything else are variables that can not exactly be repeated. Therefore such riding tests are not acceptable. When using testing machines, not only is it important to put into the frame all excerting forces but also to apply them in at the correct angles – and no forces are to be left out in order to get realistic results. We had to find a testing institute with suitable testing machinery corresponding to our requirements – and decided that Velotech in Schweinfurt fulfilled all our requirements. 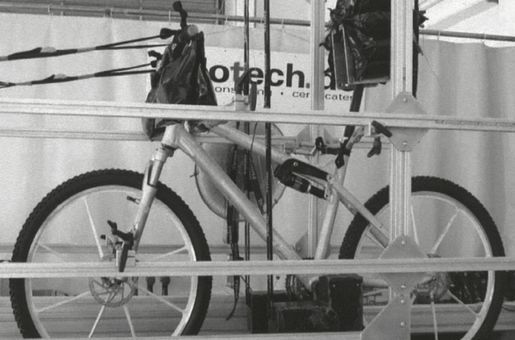 In addition to service strength testing, Velotech can perform a variety of frame, rear wheel braking, front wheel braking and stiffness tests as well as jump simulations. To top it off, Velotech has gained considerable experience over the years through accident evaluations. The main frame is clamped at the seat tube. With help of an adapter at the drop-outs the shock is compressed in small increments until it bottoms out. The respective shock travel and the necessary force are recorded with calibrated gauges. Using the recorded data, a force/travel diagram can be made: the „spring characteristic“. The test frame is equipped with fork, handle bar, wheelset and seat post. 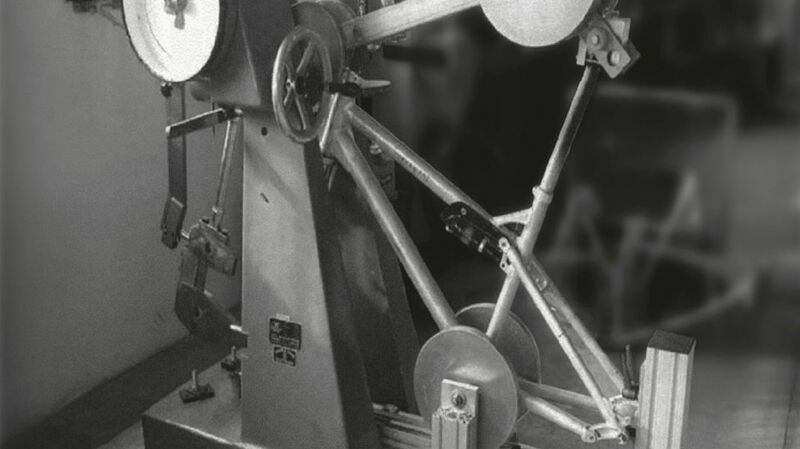 Using springs, the frame is fixed on the testing stand in such a way that it is guided but not fixed in place. The weight of a rider (plus adequate safety margin) is now distributed on bar, seatpost and bottom bracket with the aid of weights. The testing run on the roller drum testing rig includes the ride over bars of different heights at different speeds. The wheels are loaded asynchronously outside of the frequency range. The test will is run until a preset value has been reached or until frame failure occurs. The test is used to find out how the frame behaves at maximum braking forces. The introduction of force is into the fork drop-out exactly horizontal against driving direction. The test frame is fixed at the fork and rear drop-outs. The rear triangle rests on a connecting link moveable to all sides. 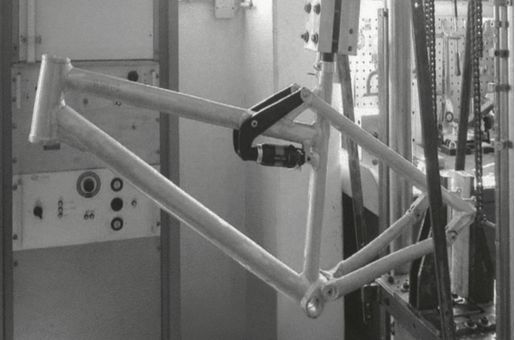 During the test for pedaling standing up out of the saddle, the testing forces are applied at the bar and at the extended BB axle. This test is necessary because significant strain is excerted on the front axle, for example while riding over big bumps or through compressions or if a frontal crash happens at medium to slow speeds. Those stresses are part of the normal spectrum of operation when using the frame. The test is run on a calibrated pendulum hit testing rig. The frame/fork unit is clamped elastically at the BB and is guided at the rear drop-out.. At the handle bar ends, the BB and at the center of gravity of the rider the frame is loaded with a combined mass of 130kg. The mass is being braced against bar and seat post when force is applied. The hits of the pendulum are directed against a solid roll fixed at the drop-outs. The energy of the hit starts at 60 Joules and is increased by 60 Joules per hit until 300 Joules are reached. – our min requirement: 5x 300 Joules without damage!